Home Cloth Diapers How to Get More Money for Your Used Cloth Diapers; Part 1: Clean Up the Aplix! How to Get More Money for Your Used Cloth Diapers; Part 1: Clean Up the Aplix! One of the best things about cloth diapers is that when you’re done with them you don’t throw them away. You sell them! We all want to get the most we can for our used cloth diapers but what if they’re looking a little sad? Many cloth diaper brands’ aplix/hook & loop/Velcro™ starts to look a bit ratty after a while and while a diaper’s new owner could clean it up themselves, they don’t want to. Gnarly looking aplix could mean the difference between selling your diapers for what they’re worth or giving them away. It only takes a few minutes to get it pretty again and taking those few minutes to fix it up will make all the difference. The first thing you want to take care of is the stray hair, threads, and fuzz from the loop fabric getting into the hook fabric. For this step, get a pair of tweezers with a thin, pointy end for faster lint picking. The before photos. Look familiar? And now for the loop side of your hook and loop. 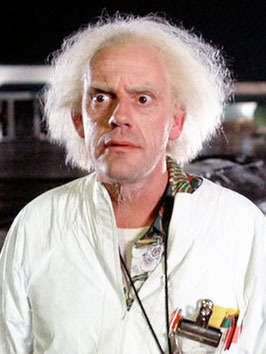 If it’s looking a little like Dr. Emmett Brown‘s hairdo then you need to give it a little trim as well. You can do this with scissors but I find it easier to use a lint shaver. *Note: Use the lint shaver sparingly and don’t allow too much pressure. If you use it too often you won’t have any “loop” left. Only use the lint shaver when you’re getting ready to sell your diapers or the loop fabric is so out of control that it keeps junking up the hook side. Now, do you have pilling along the laundry tabs or near the landing strip? You can use the lint shaver here, too, but do not press too hard! You only need to barely glide it over the top of the fabric to clean up pills. Pushing too hard could create a thin spot in the fabric or even a small hole and that will hurt your resale value more than a few pills. So how much of a difference does just a few minutes make? The after photos. Pretty spiffy, eh? Now you can put that diaper with the (formerly) nasty aplix up for sale! Is There a Downfall to Having a Large Cloth Diaper Stash? I have been wondering how to clean up the velcro. I have one diaper that is in desperate need of some love! I am not much of an aplix lover myself, and much of that is due to how they look so quickly! Thanks for helping me solve that problem. Those diapers look awesome now that you’ve done that! Thanks for the tips! Great idea! Thank you. They came out better than I was expecting! Thanks for the lint shaver trick! Also, I have found using the teeth of a snappi or boingo is great for cleaning out the hook side of velcro/aplix! Thanks for the great post I have some Bum Genius with aplix fasteners and the could use some TLC I mostly buy snap closures now.